My day started with the sad news that my longest-standing client passed away at the weekend. I’ve been working with Hannah for ten years - since 2005 - and today was the first time I've received an email about a client's death. It came as a shock, and to be quite honest I've struggled to pull myself together all day. There was rarely a time when my work sheet didn’t have a job for her company on it - whether in progress, or billed, or overdue! The last thing I said to her was that I had lost count of how many covers I’d done for them, and said I really must gather them up and make a poster, and told her that since she always had to chase me when I was busy, I sometimes didn’t know why she came back to me so often. She said something very kind in return, which made me smile, and went off on her maternity leave. So this afternoon despite having a zillion things to do, I put together that big poster of all those covers, and I’m only sorry I didn’t get round to it while Hannah was here, to share how many deadlines I almost didn’t make (and sometimes didn’t!) 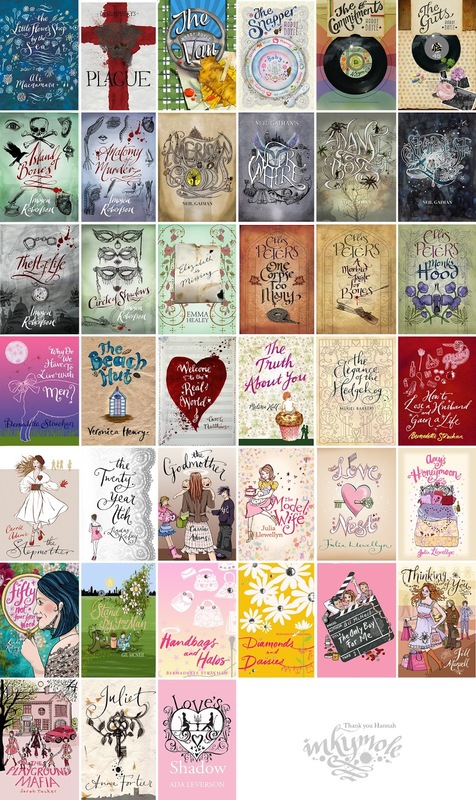 and all the lovely, varied covers I did with Hannah and her team over the years. Thanks Hannah, for being a lovely (patient) client, and helping keep my cover folio full and varied for the last ten years.